I won’t sell us short: we won silver for two brands we developed, The Oak Stave and Gallo. Those wins were gratifying because those projects hold special places in our hearts. They were among the first brands we ever created. Back in 2009, Luminus Media started with Mike designing things and Tim making websites. They were freelancers who shared the same sense of individualism and creativity, so they decided to team up. It’s also changed dramatically. “Luminus Media” became “LUMINUS.” What was once a shop where you could get a pretty great website has now become a full-service agency where you could collaborate with a team of creative professionals to build a brand from scratch. The Oak Stave and Gallo were two of our first forays into putting our branding system to the test. We’ve chronicled the Stave’s evolution already, but suffice to say it was an exhilarating process for us. Before that, people only really knew us for our websites. These brands were our chance to prove that we could put together a full symbolic system looked great and helped our clients do better business. I think it’s safe to say that we succeeded. After all, both restaurants are doing great and we walked out with two silver Addys. Back to my original point, though: winning is not a wholly pleasant experience. Winning whets your appetite for more, and when you witness the incredibly high bar your peers are setting, it can put you in a frenzy. You want to get to work immediately on something that will blow their minds. You want to prove that you deserve to be in that room. That’s what we’re doing now. We transitioned from web shop to full-service agency and now we want to really make a splash. Stay tuned for that! In the meantime, we’ll savor our victory and keep looking toward the future. From left to right: Olympic gold-winning Georgian wrestler (John English), man with eyes closed (Mike LaDuca), superfan (Josh Robinson), the Luminati (Tim Bouchard and John Connelly), “this is what the Golden Girls would wear” (Tracy Willis and Chelsea Turton), someone’s proud father (Dan Bauer). 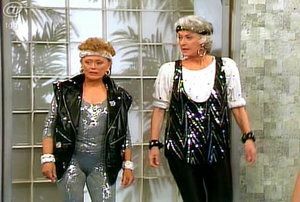 “This is what the Golden Girls would wear!” They were right. Our beloved showbook ad featuring a chair maker who is blissfully unaware that wrestlers don’t generally use his seating for sitting down. We may have been too clever for our own good.